Students at Messiah College in Mechanicsburg, Pennsylvania, didn’t seem as engaged—or interested—in The Pulse, a student-run media hub comprised of a website, magazine, yearbook and radio station as the student journalists wanted to see. Pulse branding literally can fly through the air. Copies of the magazine, published three times a semester, remained on racks. The website, regularly updated with new content, wasn’t generating the anticipated conversations. 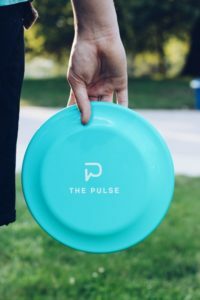 Response to freebies with The Pulse logo was lackluster. Something needed to change, Pulse staffers said, and adviser Ed Arke encouraged them to see what they could do. The students embarked on a rebranding and marketing campaign in spring 2018 that found them designing a new logo, overhauling The Pulse website, and creating new Pulse posters and brochures that were in place when fall 2018 classes started. The work is paying off. 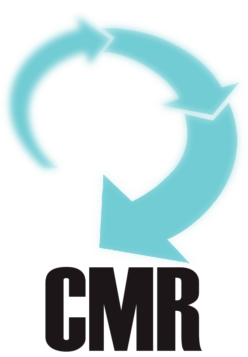 Pulse design manager Grace Demmer headed a team of six students volunteering their time over the summer of 2018 that resulted in the new circular and more compact-looking logo with turquoise as a central focus with blue and green gradients. The former logo featured lime green as a primary color. Branding and marketing have always been important for college media and their professional counterparts. A redesign and a new logo may be needed more often to keep up with an ever-evolving landscape and how the public accesses news, say media experts. “In the 21st century, branding is about owning what your company values are and what they respect . . . And owning up to your shortcomings and earning customer trust and loyalty through your words, your actions, and your stories,” writes Taylor Holland in an Aug. 17, 2017, article for Skyword.com. Marketing is typically seen as the action or business of promoting and selling products or services, including market research and advertising. Staff of The Shorthorn student newsroom at the University of Texas Arlington realize ongoing marketing, be it through social media or other work, helps promote a variety of stories Shorthorn journalists are producing, said Beth Francesco, director of student publications. 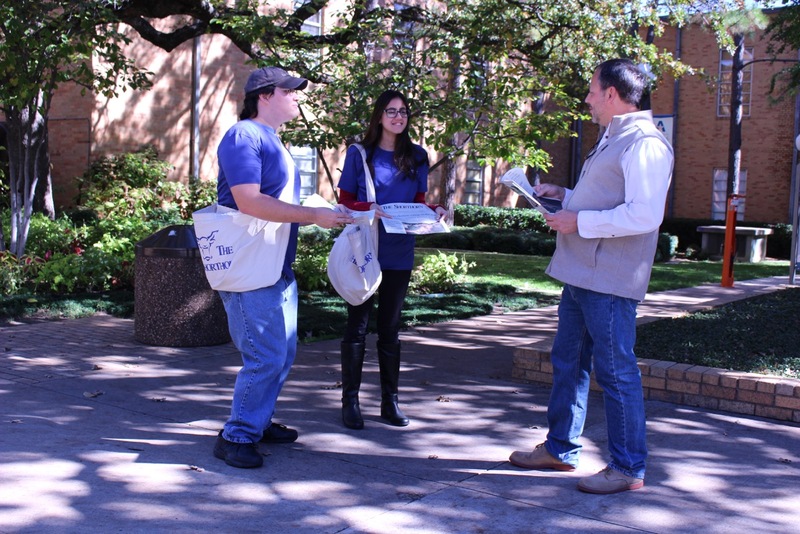 The Shorthorn’s outreach includes what it calls a “street team” Students, employed by The Shorthorn marketing department, fan out on publication day—each Wednesday—delivering that week’s copy of The Shorthorn into readers’ hands. “The students introduce themselves and summarize what’s in the edition that week,” said Brian Schopf, Shorthorn marketing coordinator. Copies of the weekly paper are still placed on more than 80 racks, but Shorthorn staff felt more one-on-one engagement was important and could be a selling point to potential advertisers, Schopf said. Expanding The Shorthorn’s digital-first approach to news coverage, The Shorthorn produces a five-day-a-week newsletter University of Texas Arlington students and other readers receive via email. “We want readers to be able to access news as easily as possible across different platforms,” said Narda Perez, Shorthorn editor-in-chief. Let’s play Plinko. The Shorthorn at the University of Texas Arlington increased attention and interest in its exhibits. The Shorthorn and The Pulse use social media to promote as well as post content. 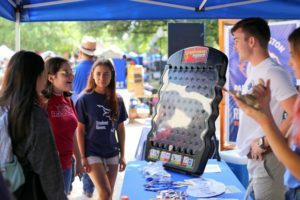 Games of chance, such as Plinko, where students can win items such as pens and stickers with The Shorthorn logo attract attendance when The Shorthorn sets up media tables at campus fairs and other events, said Schopf. College students seem to love stickers, be they news media stickers or other stickers, placing them on their laptops or other items, staff of The Shorthorn and Pulse have found. 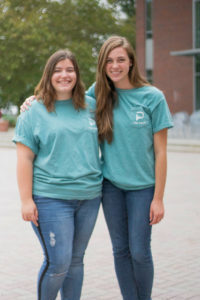 Reviewing the impact of the rebranding thus far, Vaughn and Demmer said they like seeing the fall 2018 copies of The Swinging Bridge in readers’ hands and not remaining on news racks, as well as hearing students and others talk about the latest stories The Pulse has reported. Branding, marketing, and innovation help build and maintain the public’s interest, and a commitment to accuracy, timeliness and relevance build credibility, they and The Shorthorn’s Perez said. “Student media are the primary news source on college campuses,” Perez said. Debra Chandler Landis is a freelance journalist and part-time tutor at Lincoln College in Lincoln, Illinois. 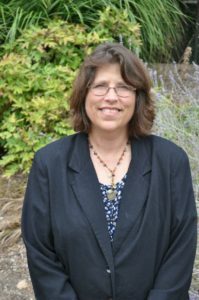 She retired from the University of Illinois Springfield in June 2017 after serving as student publications adviser for 23 years. Landis served three years as editor and two years as managing editor of College Media Review.